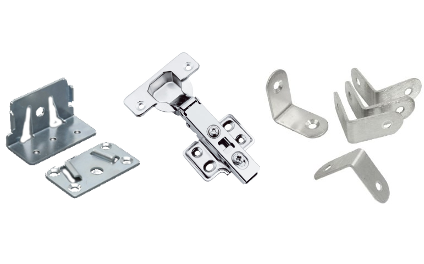 Our company is engaged in manufacturing diverse metal elements, such as angle bars, hinges and fastenings. Also, the offer includes freedom as regards the material – we offer the following raw materials: stainless steel, chrome, aluminium and nickel. Additionally, it is possible to coat our metal elements with powder in the colour selected. During production, we concentrate on all its stages. We take advantage of technologically modern equipment, and by adding to this knowledge and experience gained over the years – we are able to proudly present to you a product of the highest quality which will satisfy even the highest expectations. WHY IS IT WORTH SELECTING OUR METAL ELEMENTS? Solidity of products – owing to the qualitatively excellent metals, our metal elements will perform their functions for many generations. Diversity of assortment – we manufacture, for example, even-armed and uneven-armed angle bars, concealed hinges, fastenings for beds and upholstered furniture… It is only a small fragment of what we can surprise you. Place of manufacturing – it must be unquestionably stressed: all our metal elements are produced in Poland. It is this fact which distinguishes us from the competition. Flexibility in action – We are open to your needs, therefore any parameters, such as price or size, are issues which can be agreed on. These aspects are influenced by, e.g. the number of pieces or personalized tastes of our customers. Contact us – we will together prepare an offer which suits you best. We believe that only mutual satisfaction gives true benefit from the cooperation carried out.